In Illinois, it affects a wide number of trees. The most common hosts in our state are oak (red oak group), elm, sycamore, London plane, sweet gum, hackberry, ginkgo, and maple (sugar and red). Many other woody and herbaceous plants can be susceptible to the pathogen. The bacteria is found only in the xylem (water-conducting) tissue of the plants, and is spread from host to host by root grafts. Xylem-feeding leafhoppers, treehoppers, and spittlebugs are also thought to act as vectors for the pathogen. The disease does not spread quickly between hosts. Scorch symptoms appear on leaves in early to midsummer, and gradually intensify as the season progresses. Affected leaves may turn a yellow/green color and then turn brown, usually from the margin of the leaf inwards (see picture). Older leaves are often affected first, and an individual branch or section of branches usually become discolored at the same time. Symptoms are generally not scattered throughout the crown. Branches will leaf out the following spring, but symptoms will re-appear and slowly spread through the crown of the tree over the course of subsequent seasons. Except in oaks, leaves generally do not drop until autumn. 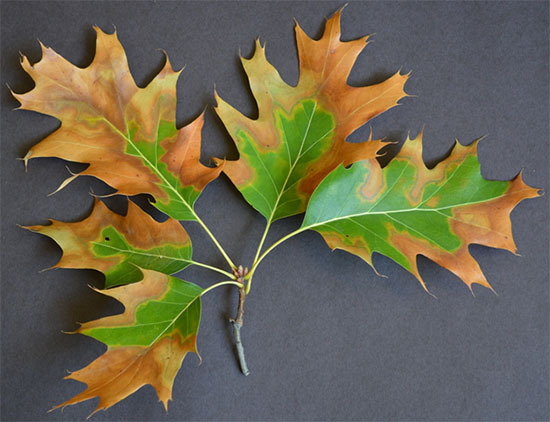 The symptoms are easily confused with drought stress, cultural problems, cankers, and, in oak trees, oak wilt. It can also be confused with Verticillium wilt in some trees. Submitting a sample to a plant diagnostic laboratory is the only way to definitively diagnose the disease. At the University of Illinois Plant Clinic, we use an antibody test to determine the presence or absence of the pathogen in symptomatic tissue. Testing is performed once a year, in late August or early September. This is because the population of bacteria within the affected tissue increases as the season progresses, so testing in late summer is most accurate due to the increased pathogen numbers. A test conducted in spring or early summer may result in a false negative due to the population of bacteria being too low. 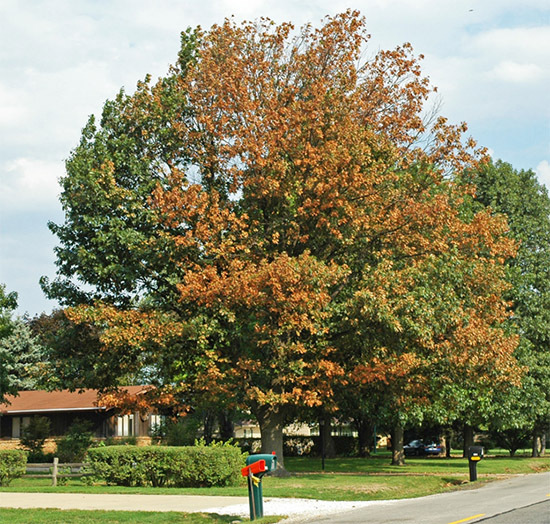 If you suspect that a tree or shrub is affected by BLS, you may submit a sample to the University of Illinois Plant Clinic starting in August. We will store the samples until we perform the test. Samples should consist of symptomatic leaves complete with petiole (the structure that attaches the leaf to the branch). Ideally, at least a few of the leaves would be transitioning from green to brown. There is a $25 fee for this test. To download a sample submission form, please visit the Plant Clinic's website at www.web.extension.illinois.edu/plantclinic and click on the "Sample Forms" tab. Please indicate that you wish the sample to be tested for BLS.